Project 4 Rough Draft Due Wednesday the 3rd! I've created a folder in our shared GoogleDrive for these materials. You can upload them as individual documents or put them all in one-- whatever is easier for you. Read the assignment guidelines for project 4, and note the job/internship resources on "Resources." In the “11-17 Activity” folder, you will find a document labeled “Activity information.” Use it to complete the activity about crafting a professional online presence. This involves reading myriad articles about the internet’s “memory” and social media profiles, and reflecting on your individual web presence. 1. Endings are hard. I know. But I want to draw your attention back to the TED Talk we examined in class. Think about how that particular speaker ended with a call to action, of sorts—something that would allow her overall point to resonate with her audience in a memorable way. We as humans have a tendency to get quieter at the end of a sentence or speech, but maintaining energy and passion all the way through to the end of a speech is just as, if not more, important than how you begin. 2. I was thoroughly impressed with how speakers in our class handled themselves during Q&A portions. So often, we’re led to believe that we need to know all the answers, at any given moment. I'm here to tell you: you don't. Embracing the power of simply saying “I don’t know” is utterly beneficial for speaking situations, and I was pleased to see so many people answer a question they didn’t know an answer to with grace and politeness. The rhetorical move of, “I’m not sure, but that’s definitely something I want to look further into,” is always a good option in case you find yourself in this kind of scenario. There are certain words people commonly use that don’t really mean anything. It’s true. Words like, "very," "quite," "actually," and "extremely" only add clutter. When deleted from sentences, your content becomes stronger and less wordy, while still retaining the intended meaning. Consider this: you can’t be very pregnant, right? You’re either pregnant or you’re not. Or consider this: “He was very mad.” Many times, if you come across an instance of "very" in your writing, it's an invitation to use a more descriptive word. Instead of “very mad,” what about “angry” or “raging?" See what I mean? Mark Twain once said, “Substitute ‘damn’ every time you’re inclined to write ‘very’; your editor will delete it and the writing will be just as it should be.” Words to live by. As you revise, look at every single sentence and ask yourself if what you’re saying is necessary, and if it is, are you providing enough information to make your point clear? 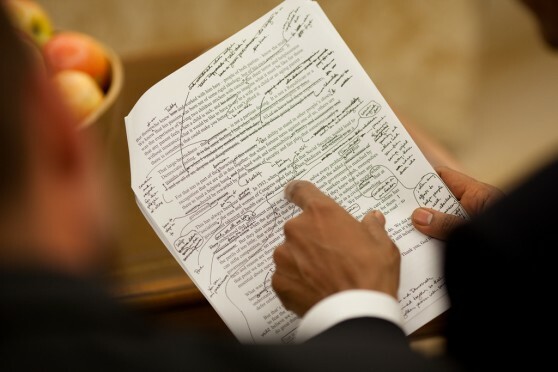 Even the President revises, sometimes on the fly, to meet his purpose and goals. Play around with your writing– move paragraphs and sentences to new locations and see what it does. Change some of your wording. Delete unnecessary information. Work towards your ultimate goal of establishing your topic as an important issue– why does this matter, and why should your audience care? Please find a copy of the presentation schedule here (this is also linked on our class schedule). Let me know if there are any conflicts I should know about, and do note that being absent on the day you're scheduled to present will result in a zero for this portion of project 3. You can find our informal reactions/responses to this TED Talk here. Conferences, while optional, will be monumentally helpful to you as you work on your writing and your presentation. If you opt to have a conference with me, come with an agenda of what you'd like to talk about/have me look at. It's not required you come with a draft, but the further along you are the more help I can be. I'm happy to look at anything you have draft to give you feedback. Presentation preferences: I'll try to accommodate everyone's top choice, but you'll have advanced notice about which day you'll present. Being absent on the day you present results in a zero for that portion of your grade. Each report should resemble what you would actually deliver to your company client. Each group's report should be turned in to me as an attachment (.docx or .pdf) via email (gelmsbc@miamioh.edu) by Oct. 13 (sometime before 11:59pm). Designate one person to email the finished project, but all group members should be CC'ed on the email. Project 2 is worth 200 points total; 150 for the report, 25 for the reflection, and 25 for the evaluation. The makers of the World's Worst Website Ever describe the project's purpose as being to highlight errors in web design by breaking every single design rule imaginable. Given our thinking about and discussions of corporate apologies recently, I thought it would be interesting to read this Forbes article on "The Art of the Corporate Apology" by Kate Kiefer Lee. We will look at this together in class on the 24th, but it contains a lot of links to various information about corporate screw-ups and ensuing apologies, in case you're interested in exploring the article further than we will have time for in class. Please print and bring HARD COPIES of your letter and your memo to class on Wednesday-- this helps alleviate potential formatting issues. Don't forget that unless you've made arrangements with me already, late work will not be accepted and you will receive a zero for this project. I have office hours today (Monday) from 10-12, and can meet by appointment tomorrow late morning if necessary. I'm willing to answer any questions by email as well. Let me know how I can help. On Wednesday, we will start preparing for project 2 by meeting in our assigned groups and brainstorming about which company you'll work with-- come with ideas to share! Don't forget to read chapter 8 in your text, on working and writing in teams. As you many of you prepare to enter the job or intern market soon, consider attending the Fall Career Fair! It's a great opportunity to better understand what's available as well as give you experience communicating with professionals. If you're interested in composing or revising/editing your resume, you have many resources available to you-- check our resources page for links to the Howe Writing Center, the Howe Writing Initiative (where I work! ), and more. Also, the Howe Writing Initiative holds small business writing workshops throughout the school year. Our first is on Tuesday September 9th and will go over resumes and cover letters. See our schedule of events for more details, and feel free to email me with any questions! I hope you all had a nice Labor Day weekend! We will look at this in class on 9-3, but as you work on project 1 consider this rubric I'll use to grade. This gives you an outline of the main components of the project-- what's most important to pay attention to and think about as you start to craft your letters and memos. Everything on the rubric coincides with something you've read about so far, so make sure to refer to the readings (5 Cs of business communication, chapters 1-3, Purdue OWL on rhetorical situation and tone, appendix in the book about formatting, etc.) for more explicit details on how you might approach each point on the rubric. Let me know how I can help you complete this project! Welcome to English 315: Business Writing! My name is Bridget Gelms (you can call me Bridget), and I'll be your instructor for this course. I'm looking forward to meeting you all on Monday but in the meantime feel free to get acclimated by looking around on our course site. This main page is where you can find major announcements or materials for class. Be sure to bookmark this site and check it often. The navigation bar above will take you to various information-- the syllabus, the tentative schedule, and descriptions of the major projects you'll complete for the course. In class on Monday, we will get acquainted with each other before spending some time going over all of this information so don't feel obligated to read this site thoroughly beforehand. This semester we will meet in Bachelor Hall room 264. It's a Mac computer lab, but I encourage you to bring your laptop if you have one. If you have any questions please don't hesitate to reach out to me at gelmsbc@miamioh.edu. I'm looking forward to meeting and working with you-- it will be a fun and productive semester!